Here we are, opening night! A rematch of last year’s eastern conference semifinals will ensure that the 2018-19 season is kicked off in style. Something of interest for the Sixers will be seeing Markelle Fultz starting alongside Ben Simmons in the Philly backcourt with Redick off the bench. For Boston, we have long awaited the return of Gordon Hayward, and tonight it finally happens. He and Kyrie Irving are both back healthy, as the Celtics are legit contenders in the east this year. Boston is -4 over Philadelphia. Basketball is back in Philly after the team lost to the Celtics in five last year, including falling in “The Confetti Game” where Marco Belinelli’s buzzer-beater was presumed to be a game-winning three when it had CLEARLY been a long-two with his foot on the line. With JJ Redick now coming off the bench, expect the bench to come with a lot of firepower. The additions of Wilson, Chandler, and Mike Muscala should help to aid the loss of losing Ersan Ilyasova and the aforementioned Belinelli. Philly is going to win with star power. Their best player, big man Joel Embiid, has high expectations for the team this year. He is a player that can dunk on anybody, swat anyone’s shot, and knock down the three at a high rate. He is a likely top-five MVP candidate coming into the season. We’ll see how Ben Simmons looks to improve after a strong rookie campaign, and if he is taking any jump shots. He has also worked on his free-throw stroke. High expectations await the Celtics this year as they come off a season where they played without two of their top three guys, and still finished first in the conference and one game away from the finals. The young core of this team, including Jaylen Brown and Jayson Tatum, is dangerous and a tough out every night. Boston will have one of the best starting lineups and deepest teams this season. Philly, who they had no issues with last year, will be the first team to take them on this season. 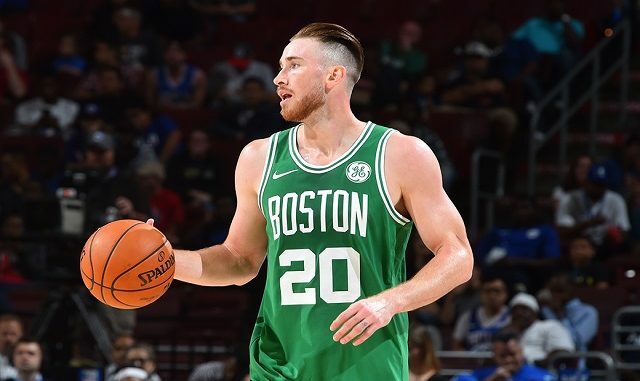 It’ll be interesting to see what Hayward’s role in this opener is and how comfortable he looks out there with the starters. Many people may be quick to forget that he signed a 4-year max contract- which pays him $28 million per year- prior to last offseason. They need him to come and contribute like he did in Utah, to prove his worth in BOS. It’ll be fun to watch this team all season long, and tonight’s matchup should be a thriller. A win for the Celtics in their season opener tonight? Yep. Favored by 4 points, they will just barely cover the spread, as Kyrie scores 30 points to lead them to a 110-103 victory over their division rival. Embiid and Simmons will not have enough in this one to lift the team to victory. 0-1.